Hi! My name is Chris Acton and I'm Chief Weaver/President/Jack-of-all-Trades for Acton Creative. I create a variety of handwoven bags and homegoods. The weaving and design work is completely done in Chesterton, IN. You can see a preview of the products on my website http://www.actoncreative.net or from my Facebook/Instagram accounts - both under my company name. 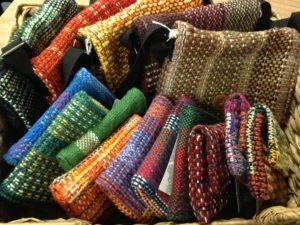 I currently offer (5) different styles of handwoven bags - the Wallet, the Mini Bag, the Clutch, the Travel Bag and the Messenger Bag. And I've recently started creating Towels, Pillows, and Runners in a variety of sizes. The fabric for each item is woven on a loom, one yarn at a time! 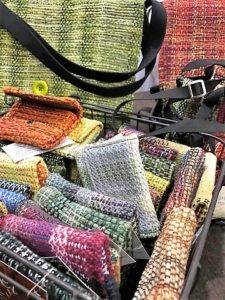 Not only do I use a traditional weaving style using a variety of yarns, but there is also a recycled option where neckties or silk scarves are broken down, woven and given new life as beautiful fabric that you can wear. Acton Creative products can be currently be found in (6) locations - POST (Detroit), Aveline (Benton Harbor, MI), Paoli Road Mercantile (Paoli, WI), Beach Bum Jewels (Michigan City, IN), Homespun (Indianapolis, IN), and Needmore Coffee (Bloomington, IN). Also, you can shop online through the website, http://www.actoncreative.net. Plus, I really enjoy custom work in the form of handbags or homegoods (runners, placemats, pillows, etc.). 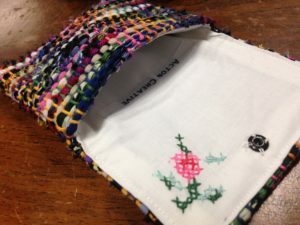 If you have a collection of Grandpa's neckties with no plan, I can use them to make beautiful heirlooms for the family. If you have an extra lengthy table that needs a runner in specific colors to match the space, I'm happy to design and weave a completely unique covering - perfect to bring the room together. Please drop me a line at actoncreative@yahoo.com to discuss your design ideas! New & Improved Website for Acton Creative! Broad Ripple Art Fair – here I come!